Pirra are a four-piece band from Sydney, made up of Jess Beck, James McKendry and twin brothers Curtis and Jeffrey Argent. The band members all grew up in rural areas, before moving to Sydney. The band is fronted by Jess Beck, whom is a solo artist in her own right and was a 2017 PDA recipient. ‘Pirra’ means moon in Luritja, the name acknowledges Jess’ Luritja heritage, and was suggested by Sammy Butcher (Warumpi Band, Tjupi Band). 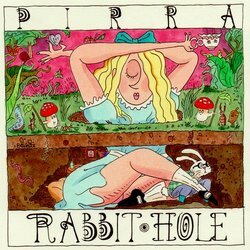 Pirra’s latest release is the 5 track EP ‘Rabbit Hole’, for which they worked with producer Nathan Sheehy (Dune Rats, Birds of Tokyo). The latest film clip for 'Get on Board' was featured on RAGE and MTV. Clickbait is an up-tempo rock track with crunchy guitar riffs, catchy vocals and some spacey synths. Although the mood of the track feels somewhat serious, lyrically the song is a little tongue-in-cheek. It’s a vague comment on how our reliance on social media has increased our vulnerability to non-credible sources of information.